I've been studying different mobile frameworks for different projects I'm currently engaged in and this is the result. How did I confront this quest of long hours of surfing the web, coding and ripping my hair? Well, first thing was to download all the JS files, code a simple REST backend with the Play framework (a post about it is in my todo list) and setup the project while I figure out what were the criteria to follow. The last option I call it the "light" one. Bootstrap is great on doing what it does, showing content which adjust it self to the screen size and it offers a lot of controls which can be easily modifiable and work flawlessly in tablets and smartphones. The thing I like the most of this approach is that I feel we won't be too tied to a framework, which allows us to support more platforms. Let's see how it goes. I had most of the information I needed, so now and start the tests. Our prototype application won't be too complicated, but I wanted to see how the different frameworks handled long lists of grouped items. jQuery Mobile seems to be the most popular around and the only inconvenience I found when using the "kitchensink" was performance on the SMGS. Using the excellent tools, I got the app up and running, even with the theme colors for the target brand in no more than two hours, with some nice effects and all. Performance was really good even when not using the minified version and the only caveat was with the "slide" effect which brought the SMGS to its knees. Not a problem with the other phones even with all effects. The nested list handled fine all the amount of items we needed. The general experience was excellent and I really liked JQM. The other frameworks are going to have a hard time beating it. Great tools like Theme Roller and Codiqa UI builder. Could be too heavy for some smartphones. 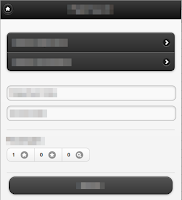 I stumbled with Sencha Touch some time ago while reviewing ExtJS for another kind of project. 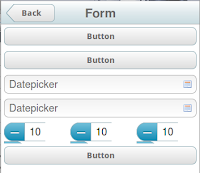 And ExtJS is great, Sencha Touch not so much. Luckily I had the experience of working with the framework and its MVC architecture but if it's your first time around with ExtJS you'll have to do some learning. Setting up the application took more work than with jQuery Mobile because I had to download, install and setup "Sencha Architect" but after this it was pretty straight forward. Note that you don't need this tool to develop with this framework, but I didn't want to waste my time moving "divs" around. Sencha Architect was really helpful, but I couldn't make the webapp look as I wanted it and some things really started to frustrate me, like placing the button icons on the right side. Here's a screenshot of pretty much what I started with. Finally and after more hours than it deserved I got the prototype "working". At first sight the application performed very well in iOS, but when I threw the list of items, not even the iPhone 4S was able to handle it. I believe the binding of all this data in the Stores and the view was killing it. With Android it was a whole different story because the performance was really poor and clicking on an item of the list selected the whole screen instead of launching a click event. 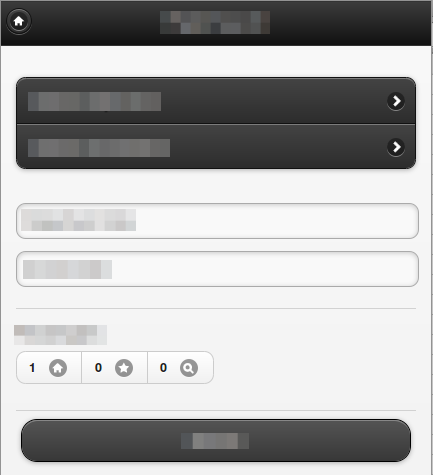 This might have been a bug in Sencha Architect, but I'm not sure. Impossible to customize controls like button icons. In general, I didn't like the experience at all compared with jQuery Mobile which took me a few hours to almost have a completely functional webapp. I've never used DHTMLX before, but the premise seems to be the same than with ExtJS: a MVC framework for RIA. And again I don't think this will work well for us on the mobile front. First, the Online Visual Designer wasn't helping me at all. For some reason it kept doing weird things. 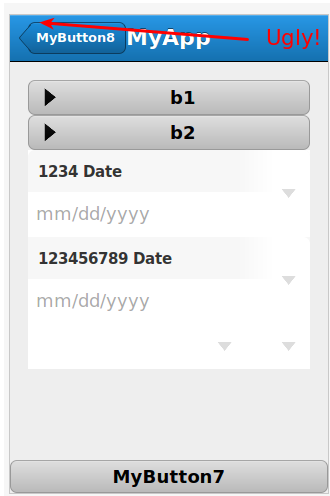 For example, try to add a "richlist" or "combobox" after you've added a datepicker. Everything is gone! Not great. But one thing got my attention and it was the performance. It was really fast loading and handling animations on the SMGS and iPhone 3GS. As with Sencha Touch, I didn't like the experience very much. The general feeling is of a beta product, beginning with the UI designer. Getting started was easier than with Sencha but then things went downhill as my lack of knowledge of how things work with DHTMLX started to show. Very good performance and resource usage. Some controls look off, like the counters are too big. This post is a work in progress, and I'll keep adding data as it's available.